I think this card’s flavor text accidentally gave away their next set’s plot. It also doesn’t provide much reprive for anyone with apocalypse fatigue. Still, it’s nice to see the ability from New Phyrexia‘s Chancellors getting some more action, and I should note that that first upkeep ability can be triggered multiple times when you have more than one in hand, and is in addition to any free scrying you get under the new mulligan rules. That might tempt people to try and fit him into combo decks where he isn’t strictly on-theme. I’m not sure Living End really needs a creature that doesn’t have cycling, but it’s interesting to think about. When you play him as a 4/4 flier that lets you scry every turn, it’s a good return by any measure, but he doesn’t end a game quite as fast as control decks would like and is surprisingly ineffective against big Gruul creatures. He will certainly take over a game in limited, and a midrange or tempo deck that keeps him in play will have little trouble staying ahead. The return of the Chancellor cycle from New Phyrexia? Not really. Sphinx of Foresight is still an interesting card, largely because of that text at the top: if you reveal it from your opening hand, you scry 3 before your first draw. This does stack with multiple copies, for what it’s worth. Being able to get rid of cards that won’t help you and set up your first few turns…what a deal, I tell you what. Outside of that, the Sphinx is still passable enough. It’s a four-mana 4/4 with flying…in a color known for bad creatures. That body on its own can do work as a serviceable finisher, able to swoop early and often once it comes out. And the scry 1 is also a nice static bonus; while it’s not as good as it was on the nigh-impervious Thassa back in Theros, it does a good job of smoothing out your draws. Never underestimate the ability to set up draws. 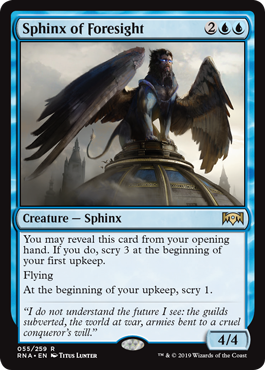 I think Sphinx of Foresight is solid enough; it won’t be an all-star, but it may have a home for its good (for blue) body and decent effects.